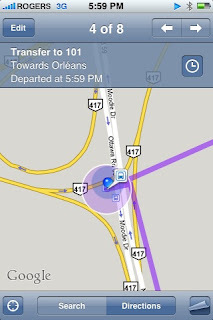 Gotta love new bus route feature in iPhone 2.2 Maps. It gives real time guesses for when the next bus should have arrived. where you need to be through construction zones and snow banks. you compose a blog post about it all. P.S. If you're at the bus stop at Moodie and the Queensway and waiting for an eastbound Queensway ride like the 101 make sure you press the button that looks like a cross walk button. Otherwise the secret light a kilometre away on the Queensway doesn't light up and no bus will exit to pick you up. Much hilarity ensues as you decompose by the side of the road over the next few days.